Ultra-high pigment concentration ensures intense colour and exceptional light resistance. For all amateur or professional watercolourists, mixed media designers and lovers of unbridled creativity. 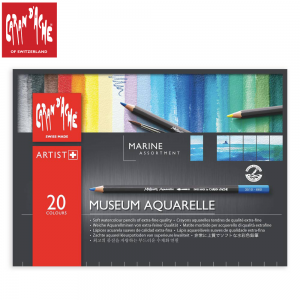 This ” Marine ” assortment contains a selection of essential colours in warm and cool tones for depicting a variety of seascapes. Saturated, light blue-greens for azure waters, deep water and the sky, light colours for the foam, reflections and light, grey-browns for shadow and rocks, reddish tones for sunsets. 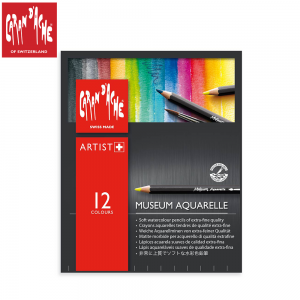 Applications : Can be applied dry or wet for wash drawings, hatching, shading, for accurate lines, washes or blurring. Techniques : Watercolour, wash drawing, shading, unlimited mixed techniques. 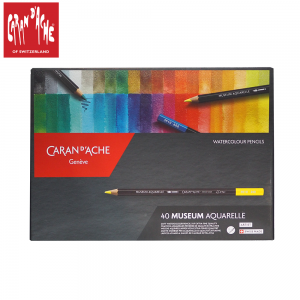 Dry or wet drawing on all media (paper, cardboard, canvas, etc.). Available in ” Standard ” 12 colour assortments. ” Landscape ” 20 colour assortments, ” Marine ” 20 colour assortments. 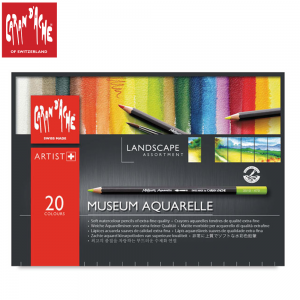 Also available as an 80 MUSEUM Aquarelle assortment in a wooden gift box set. This ” Landscape ” assortment offers a selection of the 20 essential colours in warm and cool tones for depicting a variety of landscapes. Blue-violets for sky and water, red-oranges for flowers, greens for fields and forests, browns for earth and rocks, light and dark shades to create light and shadow. 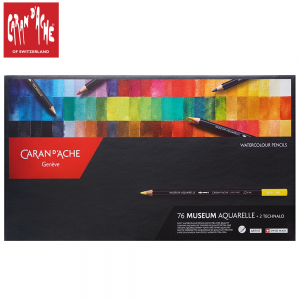 This assortment of 12 colours was selected using the ” double-primary ” system (the 3 primary colours are all represented by two shades) and is ideal for discovering watercolour techniques. Copyright © 2015. HHK Intertrade Co., Ltd. All Rights Reserved.